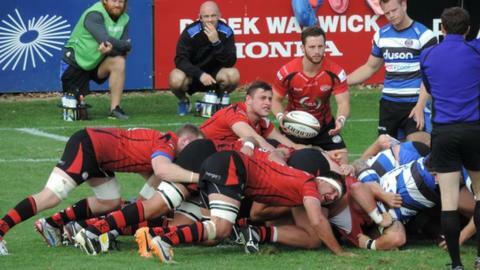 Bath continued their Premiership preparations with a 34-10 pre-season win at Championship side Jersey. First-half tries from backs Jonathan Joseph (2) and Semesa Rokoduguni gave the visitors a 22-3 advantage at the break. Leroy Houston went over early in the second period for Bath but the hosts hit back through Nick Haining's try. Olly Woodburn's late score completed the win in a game which saw Jersey-born Matt Banahan face his old club. Banahan - widely regarded as one of the island's top sportsmen - had been named on the replacements bench for Bath but was drafted into the starting line-up in place of centre Kyle Eastmond just moments before kick off. The islanders took a surprise early lead when fly-half Aaron Penberthy slotted a penalty between the posts, but Bath were not behind for long. Centre Joseph scored his first after prop Henry Thomas powered through the defensive line, before Rokoduguni's try in the corner put the Premiership club in control. Joseph showed his pace to claim his second and Bath's third, with Gavin Henson adding the extras to open the gap further at half-time. Back-row Houston's power and persistence saw him score between the posts in the opening minutes of the second half, with referee Matthew Carley knocked off his feet as the ball was grounded. But then came arguably Jersey's best spell midway through the second half, and they were rewarded when the impressive Australian flanker Haining forced his way through for his first try for the club he joined this summer. The islanders continued to push forward as the game wore on and made sure it was not an easy ride for the Premiership outfit. Bath defended strongly though and broke away for the final score of the game when Joseph offloaded to winger Woodburn who sprinted through for his third try in two pre-season outings. Jersey: Jack Burroughs, Mark Foster, Dai Bishop, Tobias Hoskins, Ed Dawson, Aaron Penberthy, Nicky Griffiths; Ignacio Lancuba, Gareth Harris, Harry Williams, Pierce Phillips, Dave Markham, Nick Haining, Ryan Hodson (capt), Michael Noone. Replacements: Sam Lockwood, Martin Garcia-Veiga, Danny Herriot, Paula Kaho, Ben Maidment, Jason Thomas, Ryan Glynn, Jonny Bentley, Lewis Robling, Tommy Bell. Bath: Luke Arscott, Semesa Rokoduguni, Jonathan Joseph, Matt Banahan, Olly Woodburn, Gavin Henson, Chris Cook; Paul James, Rob Webber, Henry Thomas, Stuart Hooper (capt), Dominic Day, Alafoti Fa'osiliva, Guy Mercer, Leroy Houston. Replacements: Tom Dunn, Nick Auterac, Kane Palma-Newport, Charlie Ewels, Peter Stringer, Richard Lane, Grant Shiells, Juan Pablo Orlandi, Tom Ellis, David Sisi, George Wacokeocke.